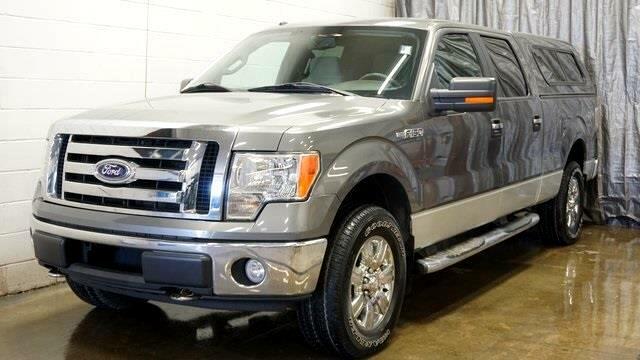 2009 Ford F-150 XLT 4x4 Clean CARFAX. 4D Crew Cab, 5.4L V8 EFI 24V FFV, 6-Speed Automatic Electronic, Preferred Equipment Package, 157" Wheel Base, 3.55 Ratio Limited Slip Axle, 7,200 GVWR Package, California Emissions, Trailer Tow Package, Premium 6 CD with MP3, XLT Convenience Package, Power Adjustable Pedals, Power Signal Heated Mirrors, Log Lamps, Power Driver Seat, Drivers Package, Keyless Entry Key Pad, Trailer Brake Controller, XLT Chrome Package, Chrome Step Bar, 18" Chrome Wheels, Satellite Radio, Auto On/Off Headlamps, Front Tow Hooks, Locking Removable Tailgate with Lift Assist, Rear Privacy Glass, Air Condition, Vanity Visors with Mirror, Tilt Wheel with Cruise Control, Outside Temperature and Compass Display, 2 Speed Transfer Case, 4 pin Trailer Wiring, Electronic Shift on Fly 4x4 System, Fail Safe Cooling System, Fully Boxed Frame, Power Rack & Pinion Steering, Power Windows/Locks/Mirrors, Tire Presure Monitoring System, Trailer Sway Control, 4 Wheel Disc Brakes with ABS, Advancetrac with Roll Stability Control, Front Side Seat Air Bags, REar High Mount Stop Lamp, Safety Canopy. Odometer is 36659 miles below market average!